Why the RM900 Fee Hike for iPay88 & MOLPay? 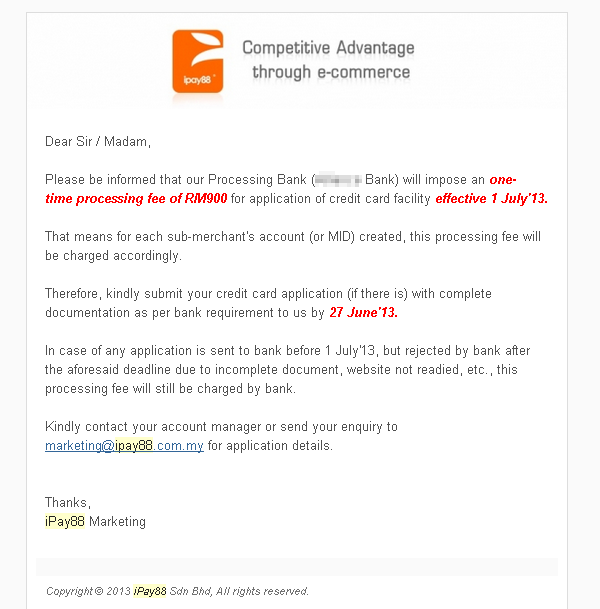 First of all, yes, it is confirmed that the top 2 leading Malaysia Online Payment Gateway providers, will start charging an extra RM900 on top of their existing setup and annual fees (see iPay88 fee & MOLPay fee). The price of RM900 just for Online Credit Card facility alone is steep, considering a low cost webStore solution like webShaper miniStore only costs as low as RM 365 per year. However, unknown to many, what are the real reasons leading to this price hike? This is what we are going to reveal here (you hear it first at ecommecemilo.com!). According to our sources, since mid of 2012, a few banks had been slapped a huge fine (6 digits) as a result of merchant misconduct against the VISA / MasterCard compliance guidelines. What actually happened? Let us try to explain in a layman way. When new merchants apply for online payment gateway with iPay88 or MOLPay, they have to declare what products they are selling online. However, 6 months later, it was discovered that some of these merchants' websites were selling fake or counterfeit products, and MasterCard had received complaints from consumers or brand owners about this. So the investigation begun, if the merchant is unable to prove the legal representative nor product authenticity (e.g. an official letter of authorized dealership), then the Internet merchant account will be suspended and the acquiring bank will be imposed a penalty! The huge penalty, is what eventually leads to the price hike. Ever since these penalty incidents, the acquiring bank started to step in to implement much stricter rules on the application documents and process to make sure it complies with the VISA / MasterCard guidelines. A new merchant will actually need to have the webstore ready (goes live with contact information, products, refund policy etc. published) to be reviewed even before they approve your account. Furthermore, acquiring bank will also run a CCRIS and CTOS checking on all the directors of the company, the same checking they will perform when you apply for a bank loan! As you can see now, all these heavy-load of pre-screening add up to cost which leads to the new fee bank is charging. As a result, the approval time for Online Credit Card application (it does not affect the online bank transfer application which can be approved much faster in one to two weeks time) has been slowing down to a halt. Take a look at the "Before vs Present" comparison we put up just for you. Fee Only Setup / Annual Fee charged by either iPay88 / MOLPay Extra RM900 (one-time-fee) charged by bank, passed on to merchants. Website goes live? Not compulsory during application Compulsory, need to file in product type, website policies, address, contact details etc. Both iPay88 and MOLPay have to follow suit as they are not financial institution and they are highly dependent on the acquiring bank to carry out submerchant ID issuing (via system like MIGS), payment settlement etc. For new merchants wanting a quick solutions to the online credit card gateway, they actually recommend merchants to use PayPal as a start. It is definitely getting tougher and more cumbersome for the smaller guys to kickstart ecommerce business. This is some of the thoughts of the CEOs (their business serve a large number of small businesses) we managed to gather and we publish this with their permission. Charles Tang, CEO of Esolved agrees that small business can only do "mCommerce"
So do you concur with the thoughts of Chan and Charles? Will the small business choose to go down a path of "mCommerce" aka manual commerce? Let us hear your thoughts by commenting below! ecInsider: Why the RM900 Fee Hike for iPay88 & MOLPay?